On Friday the stock market (Dow) plunged by 205 points, or 1.5%, that was explained by the mainstream financial press after the fact in terms of market response to corporate earnings news events, but having all but forgotten that Friday the 19th was the 25th anniversary of the Great Stock Market Crash of 1987 which saw the Dow crash by 508 points, 22% in a single days trading that still echo's through time just as the 1929 Great Crash (10% drop) echo's to make their presence felt each October that acts to reinforce the seasonal tendency for Octobers to be a negative month for stocks. The Great Crash of 1987 destroyed investor confidence that had been built up to fever pitch during the preceding 5 year long bull market. Investors were at that point ripe to be suckered into expectations for a replay of the 1930's Great Depression and stock market collapse scenario that is always bubbling away, waiting to strike AFTER each crash, to claim that financial armageddon has finally arrived. Unfortunately for terrified investors who mistakenly fell for the doom mantra would have not only missed out on the greatest bull market in history but possibly seen their wealth disappear during the subsequent 12 years as they bet against it, only to finally to realise too late that the perma bear mantra was wrong as they eventually succumbed to the euphoria of the final stages of the dot com bubble, but then to once more be wiped out on the subsequent crash that the doom merchants would claim to have forewarned off when the truth is that the doom mantra would have bankrupted all many times over during the preceding decade. What is the Lesson of not just 1987 Crash but ALL Crashes and Bear markets? The facts are if you had BOUGHT on the day following the crash of 1987 you would have made a return of 666% by now (13343 / 1740) or 26% per year BEFORE dividends, which is set against an average Inflation rate of 3%, and same holds true for if you had invested at any point following the 1929 crash! What is 13,343 divided by 381 ? What is 13,343 divided by 41 ? What are the trend trajectories off either the 1929 bull market high or the 1932, 1987 low ? Where do the trend trajectories imply the Dow will be in 5,10, 20, 40, 80 years time ? Significantly Higher or lower ? If there is a constant battle between Deflation and Inflation then why is this not reflected in the general stock market indices such as the Dow? It is because as I have explained at length over the past 4 years in well over 100 articles and several ebook's that the general stock market indices are locked into an inflationary exponential growth spiral, as corporate revenues and earnings (profits) are leveraged to rising commodity and consumer prices (fuelled by perpetual money printing currency debasement) AKA the INFLATION MEGA-TREND (ebook free download), trends of which are further enhanced by expanding profit margins as a consequence of increasing worker productivity as technological advances are taking place exponentially, for instance today's smartphone has more processing power than the whole United States had 50 years ago! And the technological advances over the next 50 years will be exponentially greater! i.e. In about 30 years a computing device on your person will have more processing power than that of the entire United States today! Think about that for a moment. You may argue that companies go bust thus this cannot be be so ? Yes, companies do go bust, but they get thrown out of the general stock market indices long before they disappear into history and replaced by EARNINGS GROWING companies, a fact that apparently fails to register in the consciousness of deflationistas' who place theory and models of what SHOULD happen over the REAL world of experience what actually takes place in investor portfolios. 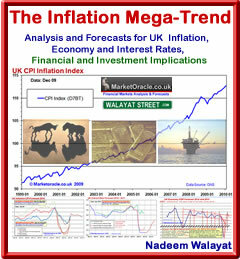 The bottom line is that there is no battle between deflation and inflation because deflation only exists in the minds of ivory tower academics or other vested interests that are paid to pump out economic propaganda to keep populations sedated as to the consequences of the ever present Inflation Mega-trend, where anything less than 2% annual compounding of official inflation (that is significantly lower than the real rate of inflation that people experience) is deemed to be bad therefore supportive of the fiat currency money printing system that all governments are engaged in utilising to enable then to spend monies they do not have by conjuring money out of thin air to buy votes. And the same holds true for most western developed general stock market indices. Now before you play pick and mix with indices, know that my analysis is focused primarily on the Dow and FTSE where the trend for these can be extrapolated to other general stock indices such as the S&P 500 and not sectors which new technologies can make redundant. Knowing these facts gives one a head start on most investors that let themselves get caught up by the media hype and sales pitches of perma doom merchants. Contrary to the vague utterances of media whores, whose commentary with the benefit of hindsight can be interpreted towards any outcome, the reality is that significant investments can only be entered into on under the basis of firm conviction's of rewards far out weighing the potential risks, i.e. to invest when stocks are cheap where the risk is that stocks could get cheaper - March 2009 - Stealth Bull Market Follows Stocks Bear Market Bottom at Dow 6,470). Subsequent price action spanning many months and even years does effect risk vs reward which is what investors should be focused upon, and not the media whores or perma-fools of whatever persuasion. 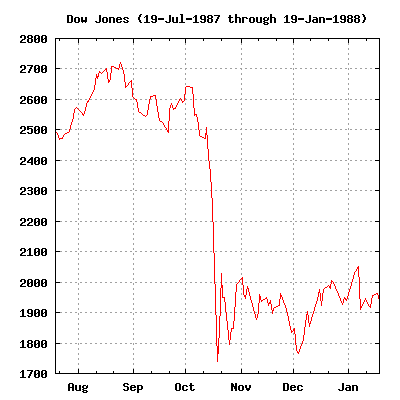 In 1987 the stock futures markets were in the infancy, where markets such as that for the Dow Jones index not formerly in existence. The only way a small time trader such as myself could gain exposure to such markets was via the likes of IG Index, spread book maker, which offered the facility of trading the futures markets at an affordable level of risk. The key elements were - a. Small position sizes of as little as £2 per point, b. all of the commission was included in the spread between the buying and selling price and c. IG offered guaranteed stop losses, so that the risk was absolutely controlled, at a little extra cost included in the spread. Stop losses are a critical element of successful trading, as you have to know when you are wrong and the best way is for the market to tell you that you are wrong by stopping you out of your position. 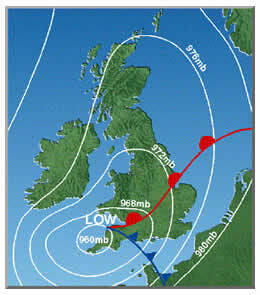 Pre- 1987 Crash - The Great Storm Hits Southern England ! I remember watching Michael Fish the BBC weatherman late Thursday night, he said. "Earlier on today, apparently, a woman rang the BBC and said she heard there was a hurricane on the way; well, if you're watching, don't worry, there isn't." Well that statement has haunted the Mr Fish ever since and is a good lasting memory imprint from 1987. My analysis had expected an up day and therefore the initial position was for the Dow to rally, this was stopped out with a loss of £165. Later in the session I took a chart trigger to go long again which I closed out with a profit of £100, so I ended the day with a small loss of £65. However the earlier downtrend had weakened the Dow and risked a break below the Sept 07 low. With the winds buffeting the house, some 180 miles north of central london, I eventually decided that tomorrow would be a strong down day for the FTSE given the brewing storm, both weather and financial. The News reporting was full of the devastation in the South of England with power cuts in many areas. Also much of the city failed to report to work and hence the UK financial markets were not fully operational. I called IG index up, half expecting no one to pick up and was pleasantly surprised that they were open for business ! Whilst I waited for the Dow Jones to make up its mind on whether it wants to break the Sept low, I shorted the FTSE twice during the day with the expectation that the unexpected storm would drive stock markets lower, and exited prior to the close with two profit trades of £305 and £30. I was alarmed by the sell off in the Dow which closed Friday sharply lower, not only decidedly breaking the September low, but the downtrend appeared to be accelerating. I spent the whole of Friday and Saturday contemplating the change in market behaviour and it slowly dawned on me by Sunday that the market was going to crash ! Being isolated from market commentators, I was not aware of the reasons of why it should crash rather that the Market's character had changed. I was kicking myself for closing the two short FTSE positions by Fridays close! For I concluded that if it was now obvious to me, a newbie to trading that the stock market was going to crash on Monday then it must be obvious to everyone else in the world ! I.e. the experienced futures and stock traders ? Therefore the futures would discount the crash and therefore how can I make any money by shorting the market on Monday's open? Anyway after resigning myself to more or less having missed the boat, I had decided that I would see if its worth shorting the market on the open, hopefully the futures will not be discounting too much of a drop, may be a hundred points from the spot indices would still enable me to profit from the anticipated stock market crash. Monday October 19th, 1987 - Stock Market Crash - Pay Day ! 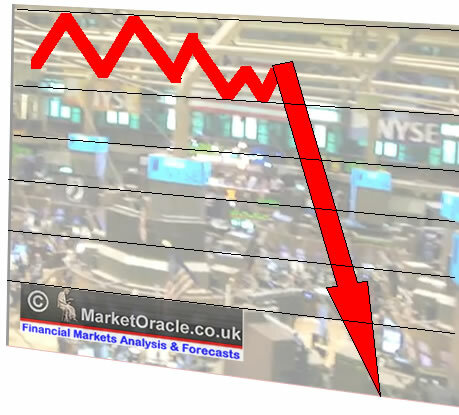 I saw the FTSE open sharply lower, down about 100 points, I sighed and called IG Index and asked for the futures prices, expecting bad news that the futures would be discounting drops of several hundred points for both the FTSE and Dow, but they were NOT ! They were discounting barely a 50 point drop from the spot indices which meant that the market was NOT expecting a stock market crash! I immediately sold the Dow Short at 2247 and the FTSE Short at 2147. Mid-day (UK Time)- I called the broker and moved the stop losses to lock in profits, which with IG Index means freeing the money for use in further positions. The FTSE was down over 200 points by now with little difference between spot and futures prices so I shorted the FTSE some more at a price of 2047. "Hi could you give me a price for November Dow Please ?" "Yes Sir, It is trading at 2045"
"Good, I would like to sell to open £5 at 2045, with a 50 point stop"
" You want to sell ?" 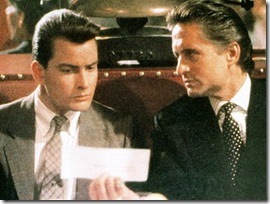 "Yes Sell", maybe he thought I was already too heavily short ? Perhaps people were to scared to short the Dow ? I don't know, but the impression I got was of surprise.on the other end of a line. So that was my fourth short opened for the day at 2045, meanwhile the actual Dow Jones spot indication was down only 50 points at about 2,200 due to slow opening of individual stocks against the actual futures nearly 150 points lower ! 7.40pm - The Dow is now down about 300 points,having rallied from about 340 down about 10 minutes earlier. Having watched the market for the last 5 hours, I get the feel that its gearing up for another bout of selling towards being 400 down, so wanting to sell more I give IG Index a call. "Hi, can you give me a price for November Dow please". "Mr Walayat, we are only accepting orders to CLOSE "
Damn !!! On a £10 per point I could have made another grand on the target of 400 down by the close. 8pm - The Dow is hovering around 300 points down with an hour to go, this is nail biting time! - I can't stand this as I cannot sell short any more and and I do not want to liquidate, so I go out out for a drive and return when the US markets have closed at 9pm. 9pm - BBC 9'0 Clock News - Dow Jones closes down 508 points at 1739 !!! cough, cough splutter, 508 , FIVE HUNDRED AND EIGHT POINTS !! Wow ! I am rich ! rich, RICH - How much ? £14,000 at least ! From an account balance of £700 to £14000 in one day ! Okay in today's money £14,000 is not a lot to shout about, but to a 19 year old in 1987, £14,000 was an enormous amount of money especially as it was made in one day ! As an example I could have bought a terraced house in the street for about £14,000! Now what to do next ? No time or inclination for sleep, I need to work out what to do tomorrow as clearly the FTSE is going to open sharply lower! This looks like a complete and utter collapse of the financial system - 508 points down ! Not in my wildest imagination could I see the Dow Jones closing down 508 points, this crash is bigger than that of 1929! Which was about 10%, not 22% in one day! I decide to close the positions tomorrow during the morning, I have made the paper profits and now to lock them in. The FTSE opens sharply lower and trades down by over 200 points by mid-day. Having watched the market trend lower, and having withheld on my decision to liquidate any of the positions thus far, I am absolutely exhausted by now due to not having slept in over 24 hours and actually starting to get dizzy so I give the broker a call to get some prices with the aim of liquidating all of the positions whilst I am still mentally able to do so without starting to hallucinate figment price action! IG is giving me a quote of 1720 for the FTSE and 1570 for the Dow 30. These are excellent prices, so I decide to close the larger Dow position at 1570. And move the stops on the other three positions. I set the FTSE position stops at 1790 and 1800, and the remaining Dow short position stop at 1730, i.e. just below last nights close, and 160 points above the current futures price. Wall Street Opens Sharply Higher and I am stopped out of all positions. Exhausted, I was off to bed. In financial terms, I made a profit of about £12,300 virtually overnight. In EGO terms the increase was much larger!, I was off floating into fantasy land of becoming a millionaire by the time I hit 20 ! 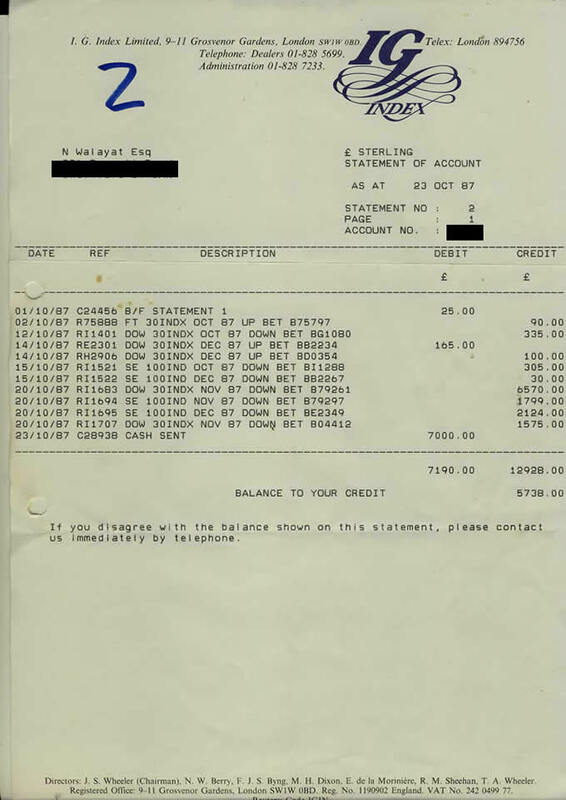 Following the stock market crash speculation was rife that some of the financial institutions may go bust , worried that my new found wealth my evaporate I withdrew more than 50% of the funds on account on the 23rd of October 1987. Of all that has come to pass during the subsequent 25 years of my trading life, one major advantage I have had that many traders have not is a clear marker against which to compare methodology and trading psychology. It may not have always been clear with so many holy grails of trading and analysis floating out there, but I have always had the option of referring back to what I KNOW with CERTAINTY that actually works. 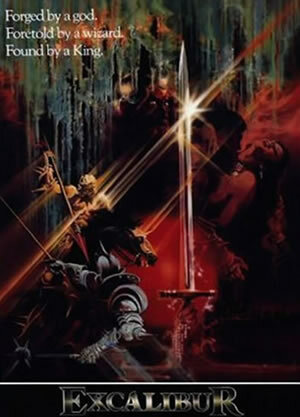 The movie Excalibur planted the seed that germinated into an important element involved in the development of my trading methodology that ultimately was able to even beat the Great Crash of 1987 that claimed many traders in its midst's. 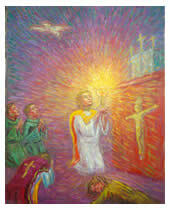 Not because I was somehow special but because I literally traded in a bubble that was filled with the likes of Excalibur and Chaos Theory, and NOT TA, and as long as I remained in that isolated bubble I was immune to the effects of the holy Churches of TA whose missionaries are always eager to seek convertion of others for a fee on promises of untold riches, that in my opinion amounts to nothing more than a sales industry geared towards selling what does not actually work as I illustrated earlier. Do you understand ? Maybe you need to watch the movie to understand that YOU are the Grail! I am tempted to diverge here and extend the scope of this light bulb moment far beyond the realms of trading, but you are probably not ready for that so will stick to trading. Now you understand what 90% of traders fail to understand during a lifetime of trading, as they remain on a constant hunt for the holy grail of trading where it seems to be a search for ever more complexity as being the answer, when instead the exact opposite is true, as Perceval discovered during his quest, the answer exists within you and not anywhere else! If you want to succeed in trading then pick the simplest tools such as basic trend analysis, use hand drawn charts and practice its application in a real-time trading environment and not only will you start to make money but it will literally become easier over time as you become expert in its application, as you reinforce your brain with the successful patterns of behaviour in interpreting the market price action. All with the added bonus that you need not worry yourself about latest great theory or technical tool that is about to be published. Pick one market and monitor / trade that market only. Use hand drawn charts to get close to the price, draw open high,low,close graphs for the daily, weekly and monthly charts and you will learn more about the markets you are trading then from any book or trading course. What you have just read goes against the grain of a whole industry built around the forecasting of the financial markets, both in terms of trading and investing as well as publishing. Anyone who has put some serious time into studying chaos theory will soon realise that forecasting is not possible to the extent where there will be enough consistency for long-term profits. 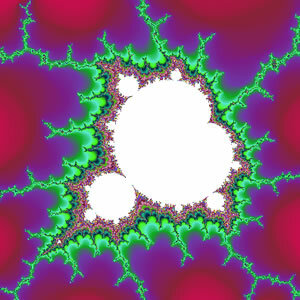 I first came across the chaos theory in the early 1980's and was eager to replicate the remarkably simple code required to generate such complex and beautiful patterns such as the Julia and Mandelbrot sets. This obsession and fascination has stayed with me since, and existed long before I became aware of the financial markets. It is probably the primary reason why I trade the way I do more than anything else, as in the early years all I understood was how to react to markets as per what chaos theory had imprinted within me, I could not imagine forecasting the markets until becoming fully aware of technical analysis. Specifically elliott wave theory and Gann Analysis both of which exhibited characteristics that were found within chaos theory i.e. fractals, but are as far as I am concerned red herrings, as the Excalibur light bulb moment illustrates and chaos theory reinforces of what elliott wave theory and gann and all other technical analysis are in terms of the holy grail of market analysis and forecasting. Today Chaos theory goes by many names, such as the 'Black Swan Events', which was coined by Nasem Taleb in his book, which I have yet to get around to reading!, but from what I have garnered it is a copy of aspects of chaos theory. Which fulfills this ages role in a more perhaps subdued manner that does not take the leap fully towards becoming a reactive mind and hence is more palatable to the technical analysis communities. The greatest example of chaos theory at work is the butterfly effect, which I am sure you have all heard of so I won't repeat. But what it implies is that order only appears to exist even in the mega-trends such as the planetary cycles that have existed for billions of years, however in reality even that cycle could be knocked out by a minor event that took place far earlier than when the system actually breaks part. Where the markets are concerned there is no effective predictable strategy, and those theories such as elliott wave theory if used as a predictive tool are highly dangerous. Yes any tool even what is perceived as a predictive tool can be used as a reactive tool. The solution here if not overly complex is to literally have multiple counts that basically suggest any number of possible outcomes. where the tendency is to lean towards the solution that most closely resembles price movements in real time, i.e. basically reacting to price movements in a highly complex and unnecessary manner. We have witnessed chaos theory in work in the ongoing banking crisis which has effectively tipped the worlds system into a new era which means that the rules of what worked during the credit boom no longer apply. Our butterfly effect was clearly when the markets were liberated from regulation in the UK this probably dates back to the 1986 big bang, so the instability in the systems have been allowed to grow unnoticed until they reached a tipping point when literally the banking system fell over the edge of a cliff. a. Identify and run with the trends for as long as they persist. b. To identify the tipping points that literally change everything regardless of the fundamentals for the butterfly effect insures that the actual instability had entered the system long before the system fails to react to 'fundamentals'. It is this that enables me to realise turning points despite the weight of fundamental and technical evidence suggesting the opposite to be true at that time i.e. today's UK and US housing bull markets as of early this year that I have yet to write up because there is scant evidence in data that they actually exist, hence embryonic bull markets. Why then Forecast if it's of little use in Trading ? Whilst forecasting may not play a conscious role in trading, however that is not so for investing, where investments have their basis on accumulating into mega-trend scenarios such as the Inflation Mega-trend, Peak Oil, Demographics, Food crisis etc. Analysis and forecast acts as a road maps against which to gauge an unfolding scenarios strength or weakness so as to know whether to distribute or accumulate into when for instance when a bull market is overbought or oversold. This is something that I have highlighted countless times to readers of my forecasts but I don't think people generally take notice of what am I saying in this respect that the forecast is not as important as what the market does relative to the forecast, as this gives an ongoing indicator of market strength or weakness against a snapshot of preceding perception of what the market should do. If you are having trouble grasping the concept of reacting to price movements then I suggest get a few books on chaos theory, and perhaps also get some freely available chaos programs that draw the mandelbrot and julia sets, and then you will start to realise the way systems actually behave and thus change the way you perceive markets. My intention remains to write a book on the real secrets of successful trading and in their application, but I cannot promise when that will be. Your Disciplined and Determined REACTIVE Trading in Real Time Analyst. Nadeem, I follow your articles since years ago, and I think this one is specially good, your brain is working bright. I am a happy reader of your market oracle letters, but though I would surgest 2 things after reading through this versio. 1) For some time I have read and appreaciated your comments and insights, but sometimes felt is was to many words. 2) Why so many traders fail. You write that one reason is that most people listen to the wrong sources - namely traders who have turned away from trading, into teachers or writers, because they have not gotten from trading what they wanted (failure). If this is true ( and sometimes it is, to my own belief) Does this maybe also apply for your truely!!! 2a) Bringing my to my point. I think that most people fail because they do not have a "toolbox", be it TA or other instructions/guidances. They lack a path and a good inner voice and mechanics plus outer references - where most publishers and educators (voices) probably are from the failing track - winners keep their formula to themselves most of the time. I myself give courses 2 - 3 times a year for different vendors, and do know what you mean about the wrong voices, but there are also people who are better teachers then traders, not being aware of it themselves. I will not put myself into any of the categories, this is for others to judge, but I myself always tell students that they should not do as I do, but do as I advice them to do, on the back of their inner voice - adapting a personal style and taking responsibility themselves, not reflecting failure upon others - which just leads to further losses, and not to the holy grail of risk and position management - no matter which tools are applied. To me the holy grail is the preparation process before and management process after the trade have been entered, and for that I do use TA inputs, including supporting indicators, but since price gives us our results, this is the final trigger and for me, entry trigger is a trendline of some sort. 1. Even in this I can see a number of elements are missing, hence inevitable questions for clarification. Yes, and I have said as much numerous times in the past that if you really want to learn to trade then ignore everyone including me. I am HIGHLY skeptical of all of the tools i use. As I say it is not black and white. At it's most fundemental it is a matter of perception. I call it being it in synch with the market. How one gets into a state of synchornisation, well that is a matter of individual perception within the guidline that the further one deviates from the current price the less in synch one is likely to be, for instance you cannot drive by staring in the rear view mirror from a backseat. You have to see the road unfold before you in real time to drive. It is individual as to what gets one in synch with the market and it CHANGES over time. But the easiest way to get in synch is by using the simplest tools that carry the least baggage with them. In my opinion, I am skeptical that consistently successful trading can ever be taught, instead it has to emerge from self practice of the application of simple tools. The Tools DO NOT MATTER, Any TOOL will Do, because it IS the Trader!